Drum Corps International ticketing manager, Kristy Holst, this week celebrates her 10th anniversary with the company. Holst, a former box office manager for the Cedar Rapids Symphony Orchestra, came to DCI in June of 1996, just in time to be thrown into the stir of the start of a new drum corps season. "In the early days of Kristy's term at Drum Corps International I used to drive her crazy asking how much money came in that day because we needed it to pay bills. She has been a huge contributor to our survival then growth as a business and a master at making the entire ticketing function work," said DCI executive director Dan Acheson. "She worries as much as I do about the money. She started with three events and now she manages more than 40. This has always been more than just a job to Kristy. We are blessed to have had 10 great years from her as an employee, a passionate volunteer and a friend." As ticketing manager, Holst handles the day-to-day operation of all aspects of Drum Corps International's ticketing operation. From managing the on-site box offices of various DCI events, to coordinating with local venues and ticketing managers, among other duties, Holst plays an integral part in the continued success of DCI. Congratulations on 10 great years Kristy! 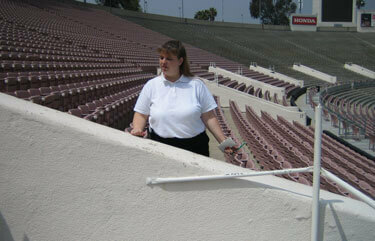 Kristy Holst surveys the seating situation at Rose Bowl Stadium in Pasadena, Calif., future site of the 2007 DCI World Championships.